With Cala Foods lease at 1401 California expiring in nineteen days, the Prado Group goes before San Francisco’s Planning Commission on Thursday seeking authorization for their proposal to divide and modify the existing 30,087 square foot space to house a 14,578 square foot Trader Joe’s and a 10,956 square foot 24-hour CVS Pharmacy. The Planning Department recommends approval with the condition that a “no queue” policy is enforced for vehicles attempting to enter the parking lot at 1401 California. If a recurring queue occurs, the owner/operator of the parking facility shall employ abatement methods as needed to abate the queue. Suggested abatement methods include but are not limited to the following: redesign of facility layout to improve vehicle circulation and/or on‐site queue capacity; employment of parking attendants; installation of LOT FULL signs with active management by parking attendants; use of valet parking or other space‐efficient parking techniques; use of off‐site parking facilities or shared parking with nearby uses; use of parking occupancy sensors and signage directing drivers to available spaces; travel demand management strategies such as additional bicycle parking, customer shuttles or delivery services; and/or parking demand management strategies such as parking time limits, paid parking or validated parking. The Prado Group plans to start six to nine months of construction in January. My favorite part of the design is all the baloons around the building. Very festive. 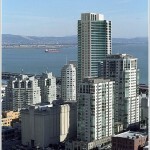 I dont understand why when SF goes through these adaptive reuse exercises, its always a downgrade with regard to size. The existing Cala is profitable at its current size. Why cut the building in half? There are virtually no large grocery stores in this part of town. And CVS is a odd fit for the location, since there is a Walgreens a block away. @Micah — that’s one of the basics of the dreaded “Manhattanization” effect, wherein it is required by law that there be a CVS, Walgreen’s, or Duane Reade on every single corner of every single street. Like the Trader Joe’s in Laurel, the Whole Foods in Noe Valley has the “no queue” policy which doesn’t do a thing to stop the traffic halting line up on 24th street. It doesn’t help that the huge delivery trucks don’t use the loading zones but instead block the north end of 24th during rush hours. However, the biggest problem is the people who refuse to get out of line. I understand that there’s no parking to be had and, no matter what bike activists spout, no one is going to ride a bike to buy groceries, still, a two block long standstill also delays MUNI, raises stress and makes for drivers making dangerous moves to go around the mess. Of course, the two parklets that take up four parking spaces, the several (rarely used) loading zones and the restricted parking areas are not helping traffic flow either. Uhh I’m all for CVS. Especially since the area is blanketed with Walgreens, and several large insurance companies are dropping Walgreens January 1. So yay CVS. But yeah I hate Trader Joe’s. It’s not a real grocery store. It’s a bazaar. There isn’t much choice, the prices are high, no fresh seafood, and their produce is terrible. Wrong. Try and find a space for your bike in the Bryant street location. Packed solid and totally undersized. Bikes have baskets of cyclists use backpacks. Of course bikes take a mere 10 square feet compared to a car’s reserved 160-200sf. This makes them less visible during the clusterf@ck of a WE TJ’s parking lot. A 24 hour Trader Joe’s sounds like a perfect solution! How do you know the Cala foods was profitable? Im not attacking you, I’m just interested in your source. Surely if it were profitable it wouldn’t be closing? I used to live at Sac/Larkin 10 years ago, and although you are right, there isn’t really any choice for large grocery stores – I hated to go to this Cala, it was a total dump. That may have changed since then Im not sure. Valet parking just to pick up a prescription refill… Beverly Hills has nothing on S.F.! I wish they would remove that ugly horizontal-canopy-banner entrance that was tacked on in the late 80’s and return to the original butterfly roof entrance. This used to be a fine example of a type of modern architecture that we don’t see much of in SF. It would be nice to bring back the original color scheme too. awww, damn. they want to rip out that sweet spiral ramp. I suppose the proposed wheelchair elevator is more practical, but it’s not nearly as stylish. Also, I can’t wait for the crackheads to set up shop in that elevator! “So why is the store closing in 2010? This is already having an impact on Mollie Stones who have revamped the amount of prepared foods they carry. eddy, do you really think so? I have not noticed any change — the leftmost aisle has always been prepared (fresh) food, and they don’t really carry any prepared preserved food, which is seemingly all TJ’s offers. I’d think this would have more of an effect on the Whole Foods just four blocks away. I ride my cargo bike from Noe to the Trader Joes on Bryant Street all the time. For loads of four bags of groceries or less it is easier and usually faster, given all the hassles with parking at that location. It is definitely less stressful and better for my health. I ride my cargo bike to get groceries all the time. In fact, I regularly carry more on my bike than 50% of the car-driving customers walking out of TJs or Rainbow or wherever. I can easily carry four full-packed paper grocery bags in the side-packs plus two additional bags or boxes of goods on the rack. Just in the past year I’ve carried loads containing the following at various times by bike: multiple pieces of 10′-long lumber, 10′ pvc pipe plus 75′-long hose, 100 lbs of compost, people (adults, child including all his crap for daycare), full picnic (including table), skis, furniture of various sorts. I’ve increasingly found that there is not nearly enough bike parking at all venues around town, grocery stores particularly. Trader Joe’s is often the worst. The TJ’s on Masonic has a scant one rack with capacity for like 3 bikes. And you can forget finding a place to park your bike at the SOMA TJ’s, as has been pointed out. If TJ’s was actually serious about encouraging people to cycle as a way to facilitate people not driving, they’re doing a pathetic job at it. There are tens of thousands of people in town who cycle daily for transportation, and growing more all the time. Time to get serious about actually supporting them. In NYC many grocery stores will deliver your purchases to your house for a nominal fee (less than $10). The City ought to require that here for new stores. Is that a goal of TJ’s? I drive my car to the TJ’s at the mall and park in the big parking lot. It’s pretty awesome. I do that too, whenever I have the occasion to go to the Westlake location. And the Walgreens one as well. I am not 100% cyclist. Very few people can afford this in terms of lifestyle and time. Around 80% of my chores and commutes are by bike, the remaining 20% by car. I can carry 20Lbs with my bike. Total cost of the trip: one burrito per 60 miles. Clearly not. But it is the City’s goal to facilitate economic activity and grocery stores without grinding the City to a halt. TJ’s stores have objectively demonstrated (due to their popularity, which I’m not saying is bad) that the amount of driving customers are severely negatively impacting traffic, transit, pedestrian safety, etc etc. This is not OK. If TJ’s wants to keep out the welcome mat in SF, it’s not unreasonable to put the onus on them to manage their customer behavior rather than dumping the impacts on everyone else. And it’s not unreasonable in the slightest for the City to require it of them. Facilitating cycling is a no-brainer easy and cheap thing to do. Deliveries is a little more involved but provides a lot of bang for the buck and can be a net-neutral cost. As a cycling and walking and bus-riding customer, I bristle at the notion that not only am I subsidizing the driving customers (it’s expensive to maintain those free parking lots and pay staff to manage traffic) as well as getting crapped on by the traffic impacts to buses and other folks by the traffic queues waiting to get into the TJs parking lots. Yes, I do drive to TJs on occassion. If everyone converted one driving trip out of 20 to a biking, walking or transit trip, the problems would diminish substantially. To echo hmmmm’s comment…it does seem like a no-brainer that as a part of the permitting process supermarkets should be required to put in much better bike parking than is the current norm. I’ve seen some really good facilities in Portland (I know, everyone’s favorite bike-friendly city). I’m not aware of any in SF. I’m not talking about the odd rack located in a spare corner, but a real bike corral with plenty of room right at the entrance. On that note, I wonder what the new Fresh and Easy on S. Van Ness will have for bike facilities…because that is in the middle of one of the most bike friendly neighborhoods in the City. Is it in an existing building? If so then expect lackluster bike parking. The other F&E locations I’ve been to have either no parking or wheelbender style racks located out in the boonies. If the building is new then expect better parking options because I believe that SF planning specifies the style, quantity, and location of bike parking at new projects. I thought TJ’s loves their car customers so much that they pulled out of the Market St location due to parking issues. With respect to shopping on a bike, I think the reason why the Bryant St TJ’s is so popular among cyclists is the fairly flat terrain in that neighborhood. Unlike the hilly Nob Hill Cala location mentioned in this post. MoD…it’s the old Cala/Bell/Delano whatever on S. Van Ness/23rd. Too bad. I would think planning would have some more teeth in a remodel/reuse, but I guess if there’s no change of use I guess not. Still, it SHOULD be obvious given the bicycle density in the hood. curmudgeon – I think that superficial facade improvements don’t trigger the requirement to upgrade the site to the latest requirements. It probably has something to do with encouraging property owners to do mild upgrades without needing to pay the costs of getting fully up to the latest norms (not that state of the art bike parking is expensive or anything). I guess we should be grateful that F&E provides any bike parking at all though I routinely avoid their wheelbenders and fall back in the standard ad-hoc solutions. I wrote to F&E about this because their wheelbenders are as expensive (or perhaps more expensive) than the better ribbon racks or Z racks. It is amazing how property managers will buy bike racks that are nearly universally disliked by bikers when better options can be had for cheaper and consume the same amount of space. I don’t know who will drive or bike but at only 3% of work commutes citywide, bikes likely represent a minor mode of travel overall (however visible). What is forgotten in these debates are pedestrians who walk not just to work (10% of all work commutes) but most places they go. 27% of SF households don’t have a car. 62% of SF households rent. 42% of SF households that rent don’t have a car. 85% of D3 households rent. 65% of D3 households that rent don’t have a car. At 35% of work commutes, walking represents the greatest mode share in D3: by contrast only 29% took transit to work, 25% drove, while only 1% biked. There may be long car queues, but I’m less concerned with bikes than pedestrians and their safety at this location. So when is TJ’s opening already?